Ed Sheeran sure knows how to make a love connection. Along with his love ballads such as "Lego House," Sheeran is apparently great at setting up his friends from "Friends." 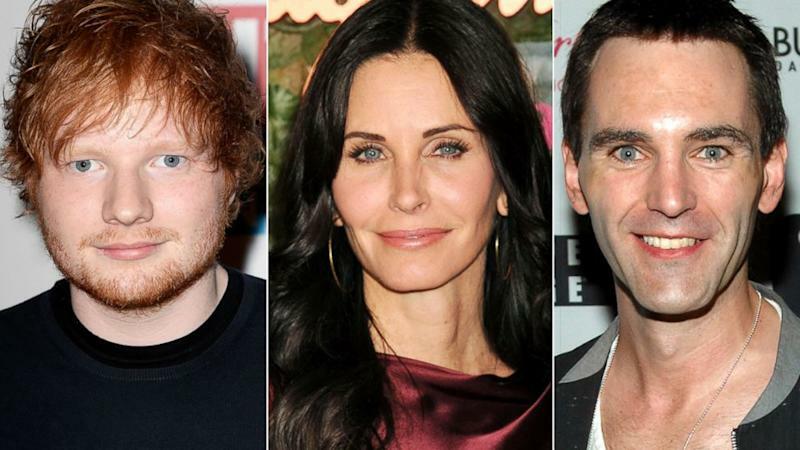 "My housemate [Snow Patrol's Johnny McDaid] who I've lived with for a year, I introduced him to Courteney Cox. They started dating and [are] crazy about each other," he said in a recent interview with OMG! Insider. Sheeran is such good friends with Cox that he got to meet Jennifer Aniston on Thanksgiving. "I ended up spending a lot of time living in [Cox's] beach house, while bumping into all these random people," he said. "We spent Thanksgiving eve at Jennifer's and Thanksgiving day at Courteney's." All the while talking about his new super famous friends, Sheeran keeps his cool and even laughs about the fact that he knows these megastars. And Aniston must really like Sheeran, as he admits he passed out drunk at her home on the holiday. "Jennifer, I passed out on her - her house is crazy - but there's these big steps that go down to the pool. I had drunk a bit too much and needed a time out, so I walked down and lay on one of the beds outside by the pool and passed out there. But yeah, Courteney's [the next day] was a bit more tame."